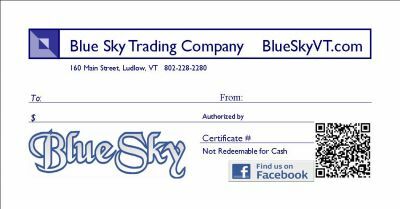 Just tell us where you saw a Blue sky ad or promo and get some Blue Sky Bucks! Good for up to $20 towards your purchase, Blue Sky Bucks are easy to use. Get $5 Blue Sky Bucks to use on a minimum $50 purchase, that's 10% in savings! And when you spend $100 or more you'll get $20 in Blue Sky Bucks toward that purchase for savings of 20%! Stay organized and enjoy a great day on the slopes! This handy neck wallet holds all your on mountain essentials. Front window for a pass, I.D. or easy access to cards. Accomodate lip balm, credit cards, cash or a few tissues in either the interior or exterior (on back) pocket. And secure any small loose items like coins and keys in the interior zippered compartment. Measures 5" x 6 1/2"
Free shipping on all stickers! Choose from classic euro stickers including (as pictured from upper left) SKI 802 and RIDE 802-These are die cut stickers (one large and one small per sheet) Large sticker measures 5" x 2.5" and small is 1.5" x .75" and sell for $4.50 per sheet. Classic Blue Sky, Stylized Blue Sky, Walking Moose, 802, VT on blue with snowflakes, White VT on green and black VT on White. Or choose a set of three mini euros with VT and maple leaf, Vt with snowflakes on green, and moose on tan with Vermont.